I've loved videogames since my misspent youth in front of a Commodore 64. By comparison, mushroom hunting has been a relatively recent activity, one I've only taken up in the last 10 years. It's a niche hobby, and one that will likely be viewed with suspicion if you bring it up in conversation. Excepting scenes of psychedilia, it's rare to see mushrooms portrayed in media, especially in the array and detail found in Oblivion. Noah Berry, an artist at Bethesda, said that using real-world plants was entirely in keeping with the Elder Scrolls series. "Personally, I've always found that some of the most vivid and absorbing fantasy worlds - in fiction, film or in games - have familiar elements operating as touchstones for the participant. Even if they only register on a subconscious level, the more realistic trappings can provide contextual grounding for the player." Hunting for mushrooms requires knowledge and attentiveness - they're often incredibly habitat specific, growing only with certain trees and then only at certain times of year. One quickly becomes aware of the multitude of microclimates in the forest: small mossy areas, dry spots, rotting wood. Sometimes the presence of mushrooms can be as simple as enough dew forming in a spot; other times the conditions may be perfect but the mushrooms will not appear. This uncertainty lends a treasure-hunt quality to mushroom picking; the next patch of mushrooms could always be right around the bend. And the attention it demands comes as a relief, taking you outside your ordinary thoughts and worries and making you more mindful of your environment. Once you lay your hands on a mushroom, you must identify it. Although this can be a complex and sometimes maddening task, it's not fundamentally different from how Oblivion presents it: You wander around the woods, look for specific environments and learn to recognize a particular mushroom by examining its appearance and surroundings. 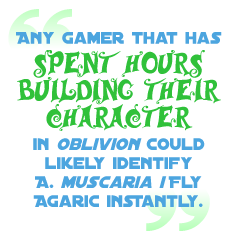 Any gamer that has spent hours building their character in Oblivion could likely identify A. muscaria (known in Oblivion as Fly Agaric) instantly. There is a form of learning here, a passive and much more subtle transmission of knowledge than that of a game like Carmen Sandiego, which presents you with facts and then offers rote memory quizzes as barriers to further play. Picking mushrooms in Oblivion is optional, immersive and rewarding. The knowledge gained is imprecise but nonetheless useful; playing Oblivion can broadly inform players about mushrooms in the same way that playing GTA IV can impart players with a general layout of New York. Although knowledge of plants and mushrooms is not likely to be of use to most people, this passive pedagogy presents intriguing possibilities for how learning in games can be structured.